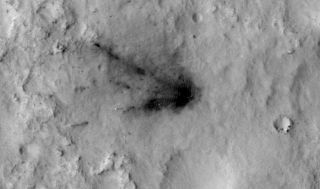 This image from NASA's Mars Reconnaissance Orbiter shows the blast zone created by the Curiosity rover's "sky crane" descent stage as it appeared in August 2012, just after Curiosity touched down. The wounds NASA's Curiosity rover mission inflicted on the Martian landscape during its August 2012 landing are healing in a surprisingly inconsistent fashion, scientists say. NASA's Mars Reconnaissance Orbiter (MRO) has been keeping tabs on four different Red Planet blast zones created by the Curiosity rover and various pieces of its entry, descent and landing hardware, such as its heat shield and "sky crane" descent stage. These scars faded steadily for about two years, but the pace slackened thereafter, and some appear even to be darkening again, as new NASA videos of the Curiosity landing blast zones show. "Spacecraft like Curiosity create these dark blast zone patterns where bright dust is blown away by the landing," Ingrid Daubar, a scientist working with MRO's High Resolution Imaging Science Experiment (HiRISE) camera, said in a statement. "We expected to see them fade as the wind moved the dust around during the months and years after landing, but we've been surprised to see that the rate of change doesn't appear to be consistent," added Daubar, who's based at NASA's Jet Propulsion Laboratory in Pasadena, California. HiRISE's observations have allowed researchers to monitor the landing scars from August 2012 to February 2015, NASA officials said. Figuring out how Martian blast zones evolve is of more than just academic interest. For example, this information is important to the team planning out NASA's InSight Mars lander mission, which is scheduled to launch in March 2016. InSight aims to study and characterize the Red Planet's interior. Part of its work will involve burying a heat probe up to 16.5 feet (5 meters) deep in the Martian dirt to gauge subsurface temperatures. "The brightness of the ground affects temperature below ground, because a dark surface warms in sunshine more than a bright one does," NASA officials wrote in the statement. The rover has been exploring Mars ever since, investigating the planet's past potential to host microbial life and how that potential has changed over time. Curiosity's observations have allowed researchers to determine that Mars was indeed habitable in the ancient past.